(Nanowerk News) Components with highly sensitive surfaces are used in automotive, semiconductor and display technologies as well as for complex optical lens systems. During the production, these parts often have to be handled many times by pick-and-place processes. Each pick-up and release with conventional gripping systems involves the risk of either contamination of the surfaces with residues from transportation adhesives, or damage due to mechanical gripping. Suction cup systems diminish residues, but fail in a vacuum or on rough surfaces. Researchers at the Leibniz Institute for New Materials (INM) have now enhanced the Gecko adhesion principle such that adhesion can be switched on and off in vacuum. The researchers from the INM will be presenting their results from 13 to 17 April 2015 in Hall 2 at the stand B46 of the Hannover Messe in the context of the leading trade fair for R & D and Technology Transfer. "Artificially produced microscopic pillars, so-called gecko structures, adhere to various items. By manipulating these pillars, the adhesion can be switched on and off. Thus, items can be lifted and released quickly and precisely," Karsten Moh from the Program Division Functional Microstructures explains. "This technique is particularly interesting in vacuum, as suction cups fail there," says Moh. With the currently developed adhesion system, adhesive forces of more than 1 Newton per square centimeter can be achieved on smooth surfaces." In our tests, the system has proved successful even after 100,000 cycles", the upscaling expert Moh says. Even slightly rough surfaces can be handled reliably. The developers now focus on increasing the adhesion force to lift and release large components and heavy materials in an energy-efficient way. Furthermore the development group works on the gripping of objects with curved surfaces without leaving residues. Additionally, the scientists also focus on developing other triggers for switching the adhesion like light, magnetic field, electric field or changes in temperature. INM conducts research and development to create new materials – for today, tomorrow and beyond. Chemists, physicists, biologists, materials scientists and engineers team up to focus on these essential questions: Which material properties are new, how can they be investigated and how can they be tailored for industrial applications in the future? Four research thrusts determine the current developments at INM: New materials for energy application, new concepts for medical surfaces, new surface materials for tribological applications and nano safety and nano bio. 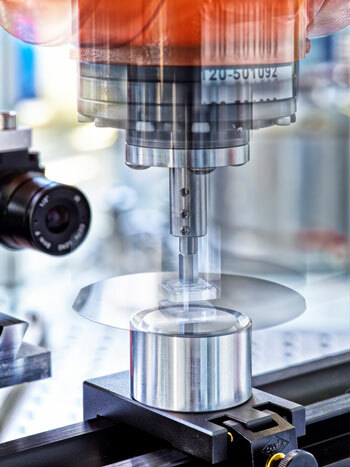 Research at INM is performed in three fields: Nanocomposite Technology, Interface Materials, and Bio Interfaces.